Catherine Duigan and Dudley Williams give examples of how the rivers of Wales have contributed to our understanding of the natural world. Dr. CATHERINE DUIGAN is currently the Head of the Marine and Freshwater Ecosystems Group at the Countryside Council for Wales (CCW), the government's advisory body on all aspects of nature conservation in Wales. Born in Ireland, her career allowed her to work extensively on the Celtic fringe - Ireland, Scotland and Wales. She is fascinated by the historic relationships between rivers and their landscapes, biota and people. "In October, 2000, I was exploring the River Dee and its tributaries as this river was being put forward as an internationally important conservation site in response to a European Directive. 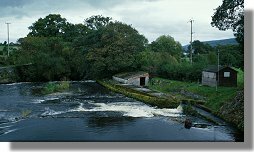 As the salmon population was identified as a key component its ecosystem, a local CCW colleague suggested that we should visit the "old fish traps" on the River Alwen. As we stood on the narrow footbridge over the river, we worked out how some of the water was diverted into an artificially constructed side channel and through a series of compartments. A small brick building with an angled flat roof still occupied the site. Shortly afterwards I picked up a copy of The Salmon written in 1959 by Jack Jones, at the time a lecturer at the University of Liverpool. It was only then that I appreciated the scientific importance of the site on the Alwen. Huddled against the cold and damp, and struggling with floods and intermittent lighting, Jack Jones spent 3,000 hours observing and sometimes filming over 90 salmon spawnings in a glass walled observation tank. His dedication allowed him to produce the first complete and detailed scientific account of spawning behaviour in salmon. He also used salmon eggs to entice a curious dipper into the observation tank and wrote of the wonderful sight of its submerged body shining like silver because of the air retained by its feathers." DUDLEY WILLIAMS is Professor of Environmental Science at the University of Toronto, Canada. Born in Laugharne (Dylan Thomas territory), he has returned to Wales many times to work on Welsh rivers, and is an Honorary Professor at the University of Wales, Bangor. His area of expertise centres around the structure and function of the invertebrate communities that are the facilitators and indicators of running water health. 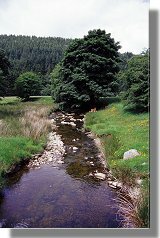 "An early experience was at the Afon Hirnant in Gwynedd, where in the 1960s my postgraduate supervisor Noel Hynes had done the seminal study that was to define the discipline of running water science. It was then, and is still, an inspirational stream and watershed. My 'baptism' at the Hirnant led to work on another Gwynedd mountain stream: Yr Ogof, near Bangor. Here I tried to solve a longstanding running water paradox (why don't stream headwaters gradually become depleted of their faunas as individuals are carried downstream by the current? ), with some success - although, as usual, nature demonstrated that there is more than one solution to a problem. Having begun my academic studies as a marine zoologist, I next turned to the estuary of the Aber River, again in Gwynedd, to try to find out what use might be made of the invertebrates drifting down from upstream. The results were unexpected and showed that they were consumed by tiny waiting flounder larvae, which increased their weight by more than 100 times on this diet before returning to the sea." DID YOU KNOW? The rare Killarney fern has very thin leaves so it needs to live in the spray surrounding Welsh waterfalls and gorges.